For years, the popular perception of heroin was that of a drug consumed mainly by edge-walking musicians and people who sleep under bridges. Somewhere between Kurt Cobain and the kid down the street, that changed. 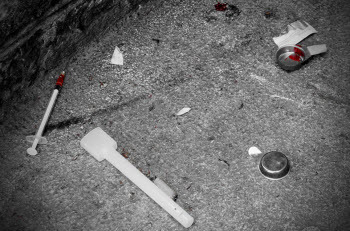 Today, if heroin were a record on the charts, it would have a bullet next to it. In 2003, 4.7 percent of admissions to publicly funded substance-abuse programs in Genesee County said heroin was their drug of choice. In 2011, that number had climbed to 26.6 percent. Oakland County went from 13 percent to more than 23 percent. Statewide, 18.9 percent of those seeking treatment were heroin users. Equally disturbing is the drug’s spread into suburban and rural areas, where it had been rare. “Heroin has been increasing suddenly for the last two years,” said Su Min Oh, an epidemiologist with the Michigan Department of Community Health. Heroin’s popularity is linked to a far more popular drug for abusers: opiate pain relievers. Both the licit and illicit varieties come from the same pharmacological family. Those who abuse prescription painkillers frequently learn that lesson first-hand. While the pain medications have the advantage of being legal and manufactured under pharmaceutical-factory conditions, they also are expensive – about $1 per milligram on the street, Masi said. Heroin, on the other hand, is cheap, with enough for a satisfying high selling as little as $5. Costly or not, both drugs can easily kill a user. Together, they can be extremely lethal: A 2005-06 surge in overdose deaths in Wayne County was traced to street heroin that had been enhanced with fentanyl, a powerful painkiller most commonly used before and after surgery. That sparked an investigation from the federal Centers for Disease Control and Prevention, which traced 121 deaths to the cocktail or to fentanyl alone. The rise of heroin’s role in overdoses, deaths and drug-treatment incidents tracks with the explosion in use of prescription pain relievers, Oh said. The fatal overdose rate for opioids increased 734.6 percent from 1999-2009, and the death rate from heroin grew by 487.8 percent. In raw numbers, fatal heroin overdoses increased from 27 in 1999 to 148 in 2009. Fatal overdoes due to opiods alone increased from 24 to 201 in the same span.